John Ernest Beardmore was born on born December 3rd 1871. He married Martha Jane Dickinson (1875-1934) in St James’ Church, Buxton, Derbyshire on September 14th 1905. 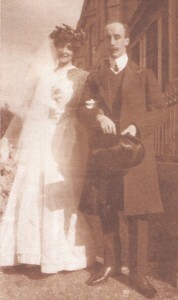 Martha Jane, who was known as Pattie, had previously been engaged to Ernest’s brother Edward Harry. Ernest and Pattie lived in Congleton and then Rode Heath and had three children: Helen who died aged about ten, Jean who married Colonel Rigby and lived in Mere, Cheshire, and John Barker who also lived in Congleton with his wife Helen. John Ernest and his brother took over Pidduck and Beardmore which became a limited company in 1919. They finally ceased trading in October 2003 at which time John Ernest’s grandson, Richard John Beardmore, and his wife Anita were listed among the directors. John Ernest died in March 1927 in The War Memorial Hospital at Congleton just three months after his brother Frank. They appear on the same page of the 1937 Probate Calendar. Pattie died at Congleton on April 7th 1934 and was buried at Odd Rode Church.